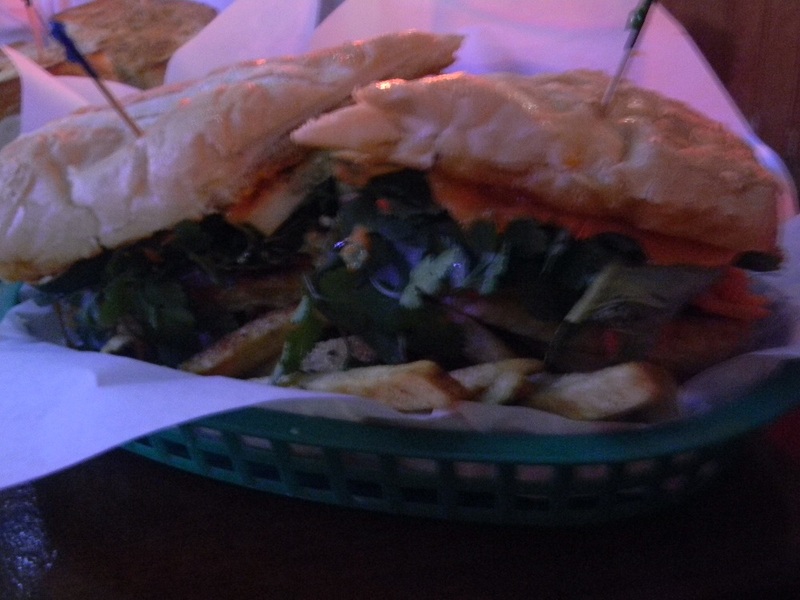 I first ate this sandwich over two years ago, fairly soon after I decided to start a sandwich blog. It’s a fairly standard vegetarian bánh mì: fake pork, cucumber, carrot and plenty of cilantro on a crusty baguette. It’s a good sandwich, but I ate it very soon after one of my experiences with the best sandwich in the world, so I had a fresh memory of a really great (pork containing) bánh mì to compare to. I wasn’t quite sure what to think. Was it fair to compare the two sandwiches? What were their relative strengths? Was I even capable of objectively considering it in its own right? That was in December of 2008, and I’ve been ruminating on the answers to those questions ever since. This is the “Banh From the Pubs,” from Hamilton’s Tavern in San Deigo. Cucumbers, carrot and daikon slaw join red onion, basil, cilantro and a house made hotsauce. In contrast to most bánh mìs, the bread here was sliced all the way through and the ingredients piled high. Bánh mìs are a lot of things, but “stuffed” generally isn’t one of them. I ate this over ten months ago, and my thoughts on the original sandwich joined with thoughts from this one and began to crystallize. Finally, I know what I want to say. I feel as if I am on shaky ground, making this declaration and making something I love so much off limits to so many people. But I’ve thought about this a lot and I feel like this is the right thing to say. I was a vegetarian for seven years. I have nothing but respect for people who make what is a legitimate ethical concern their foremost concern in what they eat. But if we sit down and plot where their world intersects with mine we cannot just place things wherever we like. We must place them where they belong. Imagine listening to La Traviata, only one of the channels in your stereo has gone out. You are still hearing beautiful, wonderful music but it is incomplete, doomed. At the height of Act II each cry from Violetta would go unanswered, she would plead with no one, finally agreeing to sacrifice her greatest love, giving in to non-existent demands, an empty hissing sound. That isn’t art, it’s tragedy. 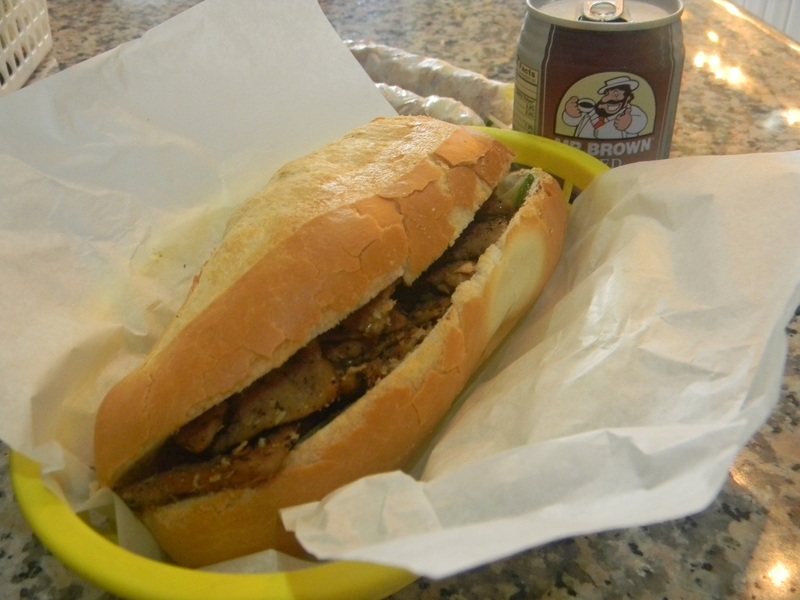 Someone asked me about the sandwich from Tofoo Com Chay. “If I’d never had a regular bánh mì,” I said, “I’d think this was a really good sandwich.” But I have had one, and I cannot help but think that one without meat is irredeemably flawed. It might seem silly, at first, to suggest that people who do not want to eat meat are missing out because they aren’t eating meat. But knowing this sandwich both with and without meat I cannot help but define those without by what they lack. Consider a person who drives a convertible, and more than that refuses to leave the house when it rains. The only decent thing to do is to respect their choice, but I have no obligation to think it complete. Moreover, I wouldn’t suggest they approximate the experience of sharing a kiss in the rain by necking under the shower head. The meat, the pâté, it’s all missing here, and it’s a striking absence. People who don’t eat meat make a choice, one I respect and understand. That choice includes giving certain things up, and I suggest that bánh mìs should be among them. The two sandwiches make my point in different ways. The sandwich from Tofoo Com Chay presents a fake meat in place of pork, meaning it is aping the particular style of bánh mì that I love so much. This is directly what I am addressing above. The sandwich at Hamilton’s, meanwhile, forgoes any mimicry and just rachets up the heat. Making a sandwich more spicy can improve it, but it can’t save it. If this is what your sandwich needs to be interesting, good, or seem worth what you charge for it, I suggest you have gone wrong at some early step and ought to revisit the whole thing. So two bánh mìs attempt to solve the problem of being incomplete in different ways, and both come up short. Their problem, I feel, is that they have taken on a challenge that cannot be met. In attempting to critique my own point, I considered the “So what?” angle. If people like these sandwiches, shouldn’t that be enough? There’s merit to that argument, and if we were talking about any other kind of sandwich I might agree. But there’s a lot of hype surrounding bánh mìs, hype that I help sustain. Not too long ago an associate told me he was off to try one for the first time. I practically held my breath until he delivered his report. I knew what heights the sandwich could deliver but was terrified that a stroke of bad luck might forever sour him on the sandwich I love. Thankfully that story ends happily, but when I consider these sandwiches I cannot help but be concerned. The casual sandwich eater rarely seeks out different versions of the same archetype; They know what they like and when something new falls short they go back to what they know. Imagine some budding sandwich enthusiast takes only a quick glance at the menu, not noticing that there’s no meat involved. They receive this sandwich and think “That’s it?” The idea makes me shudder. I feel like a bit of a heel, saying what I’ve said here, and I ask that my non-meat-eating friends forgive me. I love sandwiches, and I love the bánh mì above all others. It deserves honest consideration, even when the conclusions I reach cast me as something of a jerk. This entry was posted in A Month of Bánh Mì, General Sandwich Discussion, Sandwich Reviews and tagged Banh Mi, San Diego, San Jose, Sandwiches I Have Eaten, Sandwiches Made For Me, Vegetarian by Pete. Bookmark the permalink. 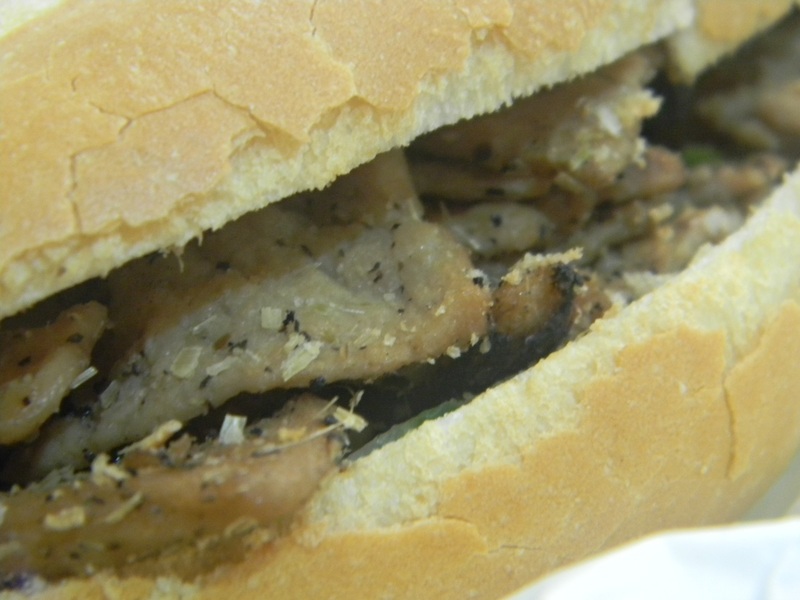 As a vegan, I suggest trying the mock chicken sandwich at Hanco’s in Brooklyn. Give it another shot; different places make different sandwiches. I will do that; thanks for the suggestion. I don’t mean to claim that these are bad sandwiches, the one at Tofoo Com Chay is particularly tasty. They’re just different, and unfortunately doing an impression where they should be doing original material. For the record, these are not the only two vegetarian banh mis I’ve ever had. And to tweak your analogy, how many songs would it take you to figure out that pop punk isn’t grindcore? In any event, I will take all suggestions under advisement and should I find a sandwich that makes me reconsider the above, I will not hesitate to write about it. I love Mr. Brown/Hello Boss. Such a delight. This was an interesting analysis. Some things cannot be replicated well in a vegetarian form. It doesn’t mean they should stop trying but after a point you get the idea of how it is going to be. Being a successful vegetarian requires understanding that there is a sacrifice on your part if you do find things like pork delicious. I do love to see vegetarian options everywhere and in new and interesting forms though so the more the better, even if they are pale comparisons to the real thing. It’s better than a rice sandwich. A rice sandwich! Mercy, I hesitate to even consider it. I spent 7 of my younger years as a vegetarian, so I know what you mean about sacrifices. I don’t want sandwiches like this to stop existing, I just think they’re better served in their own category.